Was it because of the acute sense of shame I felt when Amir Khan so convincingly demonstrated that he is actually a farmer (a farmer by birth, the same way in which Uday Chopra is an actor by pedigree) and not just a celeb trying to grab land under false pretenses as I had initially thought? Was it because of the viral effects of “I am playing a gangster because my sister is the producer” Tusshar Kapoor in Shootout at Lokhandwala say “Ganpat zyara daroo la” with the threatening menace of a “Maa bhookh lagee hain”? Was it because of the voice in my head which kept on saying “Main tera khoon pee jayoonga, haddi pasli ek kar doonga” each time Dharmendra brought his lips close to Nafisa Ali’s with garam Hashmian passion in Metro? Was it the sight of Himesh Reshammiya taking his cap off and revealing his Rapunzelian locks in one of the innumerable Aap ka Suroor–the real luv storiee teaser trailors that set off the sinister trail of events? Was it Shekhar Suman’s new steamed reptile, Iglesian look and his wanton display of male cleavage (as Suman-ji says: ” I have always said that if you have it, flaunt itâ€¦ I sincerely believe that my chest- line is looking good. It’s like you want people to notice your good clothes, similarly if I have a chest line which I can flaunt then why not? Women have cleavage and I have a great chest- lineâ€¦“) that short-circuited my immune system? Or was it my appearance on the exclusively for women Meow FM 104.8 in New Delhi that caused the problem? Whatever may have been the cause, I have been laid low with fever and stomach convulsions for some time now. I am however back. In full technicolor. A sincere word of thanks to all those who commented on RTDM or mailed me enquiring about my health and wishing a speedy recovery. Ahh… welcome back! Looking forward to more posts from you! Wishing u a speedy recovery 🙂 Glad that you are back! Whoa? Were u sick? I thought u were in India weren’t you?? Wishing you a speedy recovery GB. From the looks of this post, you SURE are back. The Dharmendra line is split wide open, i.e., phata phati. Obviously you’ve kept up to date with Bollywood only because of your duty to your readers. And the Priyanka-JB-Mamata line-up in the banner is priceless. Patent it! Get well soon :). Perhaps your next post could be on “Apne” … starring Dharam paaji, Sunny paaji and Bobby paaji. I was just beginnning to wonder if u have taken blog sanyas or if u had moved! Good to see u back!!! It shud have been definitely due to lokhandwala. What an idiotic film it is. A total waste of money. Anyway, happy to see u back. Happy to see you back. Take care. Had no idea that you were ill. 😦 But very glad to know you’re feeling better. Take care. Good to see you back GB, take Care. Just saw the promos of the Aap ka suroor movie, The guy gets to keep his cap on even at the prison. Probably he threatned them with a sing otherwise :-). Must be the sight and sound of Himeshji. Or was it Sumanji’s cleavage? Oh well, enough to turn anyone’s stomach. Glad to have you back dada. Unfortunate happening, and hope you’re you’re back at full energy now, Arnab. i cracked up on each of those questions above. Gr8 to have u back GB!!! Now pls start commenting on the ‘burning’ issues of this nation and the world around….we need that!! a long tme reader. but missing the great bong. made me write. Hate to admit this..But Yes! Awesome dude..glad to see u back in action..loved man cleavage! Welcome back maan. Hope the ‘illness’ did not cure your dementedness!!!! Thank you all. Yes I am well and truly back. Good to see you back. Visiting home always comes with a package deal of special incentives of the viral and bacterial infections. Cannot avoid them, no matter how hard we try. I will be traveling with my little one and hubby soon. Letâ€™s see what deal we have in store for us. 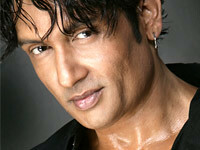 Is that Shekhar Suman in the pics? Whatever he did to himself to hide his ageing cells? Seeing his chest line in the 80â€™s may have been ok (he used to come in a DD serial Sunday afternoons as a shy neighbour, canâ€™t remember the name of the serial, liked him only in that serial). Welcome Back GreatBong..Great to hear from you! It is wonderful to have you back GB..Wish you fully recovered from ill.I’d seen Himesh Reshammiya’s picture without his cap in reddif,But the picture is not showing his head completely,If you’ve the clear picture please post here. Welcome back GreatBong…..It’s a pleasure to see your new posts. Himmes bhai said that he will reveal a secret in this movie – any ideas as to what it will be?